This “argument” (from no gods to no God) may be compared to the following two illustrations. Imagine a maths student who made a study of various mathematical conjectures that have been shown at one time or another to be untrue, and who then concluded that he did not believe in mathematics. Or, imagine a fish who heard of various shallow puddles that could not support fish life, and having decided that he did not like those, he announced that he did not believe in water. Admittedly the religious issue is a good deal more subtle than the relative simplicity of mathematics, and it is a lot easier to come to agreement about mathematical theorems than it is about what constitutes life well lived, but my illustration is apt mainly because it gets at the category error being made in these simplistic pronouncements made in the name of atheism. The difference between gods (entities or beings that you can try to manipulate) and God (that which you can never manipulate or even thoroughly define but only reach for and learn from) is a religious basic, a sort of level-one lesson that is easy to learn and has been well established for at least three thousand years. The attempt to overthrow it seems to be largely based on a linguistic confusion, in which the English language (and some other languages) adopts the same word for two superficially similar but in fact profoundly different sorts of thing—gods and God. Confusing these is like confusing a conjecture with mathematics itself, or like confusing a puddle with water as such. Please be clear on what I am and am not claiming in my simple illustrations. By the fish illustration I do not intend to claim that the Christian account of what is real and what is not is as obvious as the role of water in the life of a fish. I don’t claim that it is obvious; the illustration is there simply to show what kind of thing it is. We are not conjuring up another puddle; we are becoming aware of the nature of the water in which we live. We are not conjuring up an authority-figure to serve and fear; we are becoming aware of the compassionate embrace, and the implacable challenge to justice, that deeply liberates all that is best in the human community. Well, to be honest, a lot of the time it is nowhere near as good as this. A lot of the time, in our foolishness and pride, we are indeed serving up more puddles and thus doing both ourselves and the wider world a great disservice. But at least we are aware of the issue. We are aware of the difference between conjecture and mathematics, puddles and water, religious confusion and religious discovery, fear and love. The reason I have written this piece is, in fact, not so much to protect Christians from insults, as to try to encourage the atheist community at least not to disseminate amongst its own members statements that are very ignorant and really amount to a form of prejudice (in the form of wilful ignorance or blanket dismissiveness). Because, no matter what convictions anyone lives by, that sort of behaviour does not do anyone a service. It does not do an adult a service, nor a child, nor even an escapee from bad religion. 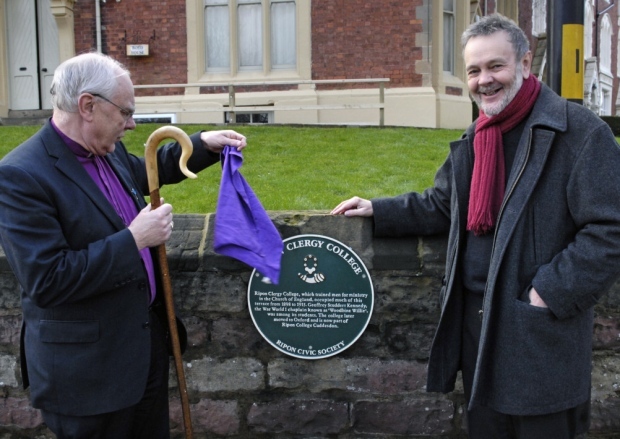 The Rt Rev John Packer, Bishop of Ripon and Leeds, and Ripon Civic Society Chairman David Winpenny unveil a plaque outside the former Ripon Clergy College, commemorating Rev Geoffrey Studdert Kennedy (“Woodbine Willie”). I recall an interview with an editor of a leading science journal in which he said that 90% of the papers they published subsequently were shown to be incorrect (I can’t recall the actual term he used – it may even have been “false”.) An erroneous argument could be made from this admission along the lines of “Why should we then believe any science?”. It is this kind of argument that is being made. But in the current intellectual climate any comment by atheists is sophisticated and clever because they appear to be, in their own terms, brighter than the rest of us. Keep up the good work!